Long before Nintendo released the Wii, gamers were introduced to the successor to the Nintendo 64. After all the feats the Nintendo 64 achieved, would a new system ever be able to outshine it? When gamers saw the first previews of the Nintendo GameCube in 2000, they knew there would be marvelous things to come. Nintendo released two chief Zelda games for the GameCube, the masterpieces known as The Wind Waker and Twilight Princess. The Wind Waker gave Zelda fans a glimpse into the potential of the new system, and Twilight Princess, though it was first released for the Wii, was still intended to be one of the last major Nintendo releases on the Gamecube. Although Nintendo produced these two games for the same system, the differences in the two titles are surprising. The Wind Waker and Twilight Princess are both critically acclaimed games, receiving a score of 96 and 95 out of 100 from Metacritic respectively, based on the opinions of over 70 critics. However, gamers’ original opinion of these titles differed greatly at the time of their reveals. When the news of a Zelda game for the new Nintendo GameCube system arose, fans were ecstatic. After classics like Ocarina of Time and Majora’s Mask, gamers were ready for a new adventure to live up to the reputation already built by the Zelda franchise. However, the trailer for The Wind Waker unsettled fans after seeing the original Spaceworld 2000 GameCube demo. The new, “childish,” cel-shaded graphics were not taken to kindly, and gamers yearned for a look more like Ocarina of Time. When The Wind Waker was released in the United States in 2003, casual gamers and Zelda enthusiasts alike both were perturbed by the sheer size of the overworld, which was more like an enormous, bare sea than the dense, busy Hyrule fans had become accustomed to. Gamers and critics worried that the vast ocean would make completing the game and its sidequests nearly impossible. As people played through The Wind Waker, however, most learned to appreciate the experimental graphics, innovative game mechanics, and fun, interesting quests. In the end, both kids and adults, casual gamers and Zelda die-hards, could appreciate the exciting and unique voyage The Wind Waker provides. On the other side of the spectrum, the second main title set to release for GameCube, Twilight Princess, was originally hailed as the game that would finally dethrone Ocarina of Time at the top of the Zelda pedestal, or even become the best game of all time. Twilight Princess’s trailer release at E3 2004 was received with extreme enthusiasm, as fans saw a title ready to bring back the grandeur first experienced in Ocarina of Time. As Nintendo released more and more news about their latest work, fans worked up a wave of hype the game simply could not live up to. Numerous delays in the production of Twilight Princess also warranted unrest in the minds of gamers. They wanted the new title almost immediately. They were ready to finally find a game that would succeed the hype created by Ocarina of Time. Not only did fans think Twilight Princess failed to live up to expectations created over the course of three years, but some even believed it wasn’t a good representation of the Zelda series. Even still, some gamers were more than disappointed; they felt the game was not good as a whole. Criticism arose that it was simply too easy, too long, or too dark, something Zelda fans hadn’t seen since Majora’s Mask. However, many people new to the Zelda series, myself included, found Twilight Princess to be a fantastic game. For some, Twilight Princess outshone even Ocarina of Time. It is unfair to make a judgment on Twilight Princess when subjected to such a cloud of hype. When a game is placed on a pedestal even before it is released, it is almost impossible for that game not to fall short of expectations. Although Twilight Princess was not the epic, instant classic Ocarina of Time was, many gamers consider it to be a great game, despite any flaws it has. It seems that the early impressions of The Wind Waker and Twilight Princess were quite different than how gamers actually felt after playing the games. In both cases, fans believed one thing would happen, when in fact, upon release, quite the opposite occurred. Most gamers agree that despite the cel-shaded graphics, The Wind Waker was not specifically intended for children. Kids, teens, and even adults can enjoy everything it brings to the table. On the other hand, the first Teen rated Zelda game, Twilight Princess, contains a darker, grittier, and more realistic atmosphere, making it appear that Nintendo directed that game at an older audience. The Wind Waker’s story, matching its colorful, bright graphics, begins with pleasurable adventuring. Most often, the gamer was focused on an epic adventure, such as collecting the pearls of the goddesses, raising the Tower of the Gods and retrieving the Triforce shards. However, The Wind Waker is not just a Search-and-Find. It is filled with quite a few darker elements, and although those elements are subtle at times, they deepen the plot. An early example of this is Link’s first visit to Greatfish Isle. One might expect to find a pleasant island of sorts here, but what has become of Greatfish Isle is not welcoming. Link finds the stormy isle in ruins, as if a mighty earthquake shattered it. After the visit to Greatfish Isle, Link would soon find out about the land below the sea. Hyrule, a once great kingdom, had been decimated in the Great Flood, with its king bound to the remains of the empire. Link learns the history of Ganondorf, how his people suffered in scorched lands, and how Ganondorf had almost unselfish intentions in his quest to find the Triforce. Toward the end of the game, the plot of The Wind Waker is more profound than many people realize. However, despite some dark moments and themes of decay, The Wind Waker experience is still based on the gameplay mechanics of exploration and discovery. Unlike the gameplay-driven mechanics of The Wind Waker, Twilight Princess featured a deep story, distinctive from most other games in the Zelda franchise, perhaps with the exception of Majora’s Mask. It seemed that at some points, Twilight Princess relied more heavily on the plot than actually playing the game. An example of this was the fight against Zant. Sudden, intimidating meetings with Zant provided you with an air of mystery, and left you wondering more about this chaotic character. In the end, it is revealed that Zant is merely a puppet, and an unstable one at that. The fight against Zant was simply a rehash of other boss battles throughout the game, lacking originality and creativity. Despite the weak ending and inability to live up to its potential, Twilight Princess consistently gave the gamer a new aspect to the story, be it Midna’s revelations, or the flashback to Ganondorf’s execution. However, these things certainly made the plot much darker and drearier, quite the contrary to its GameCube predecessor. The Twilight areas were certainly more nerve-racking than almost any part in The Wind Waker, supplying the more mature feel to the game. The graphical style in both games seems to match the theme of the plot; colorful, bright, and cheery for The Wind Waker, and darker, more mature, and realistic forTwilight Princess. Nintendo designed The Wind Waker and Twilight Princess to benefit from the potential of the GameCube. The Wind Waker was much like a trial-and-error experience, while Nintendo was more familiar with the system during their creation of Twilight Princess. One would expect that after years of experimenting, the gameplay styles of these two games would be quite different. The Wind Waker was the first game to really take advantage of the new technological capabilities. It introduced new gameplay mechanics to the Zelda series. Traversing the Great Sea would be impossible if not for the King of Red Lions, the magical, speaking boat. This was the first time the franchise incorporated an essential vehicle, not counting Epona in previous games, to travel long distances, which we would see again in the Nintendo DS titles Phantom Hourglass and Spirit Tracks. The Wind Waker also brought several classic items back, such as the Hero’s Bow and the Boomerang, but also established a myriad of new items, ranging from the telescope, to the Deku Leaf, to the Deluxe Pictobox. In addition, it also was the first Zelda game that featured the use of the Nintendo GameCube-Game Boy Advance Cable. This allowed the player to use an inventive item, the Tingle Tuner, on the Game Boy while playing The Wind Waker. We would see the return of the GameCube-Game Boy connector cable in Four Swords Adventures. Years after the release of The Wind Waker, the next major GCN addition was stocked on store shelves. 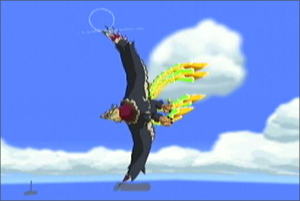 Twilight Princess brought back the same basic control scheme with different equipment, such as the Spinner and the Dominion Rod. It also brought back quite a few items from The Wind Waker, like the Iron Boots and the Magic Armor. On the other hand, the port of Twilight Princess designed for the Wii featured different controls than the GameCube version. The mechanics for the Wii version weren’t very widely accepted at first. Many gamers felt these controls were “gimmicky,” and preferred the GameCube format at the time. Using the same scheme as The Wind Waker to wield your sword, Twilight Princess introduced a new set of techniques, the Hidden Skills. 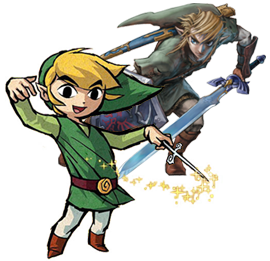 These were sword skills taught to Link by the Hero’s Shade throughout the game, strengthening Link’s ability with his sword. Unlike The Wind Waker, Twilight Princess gave you the option to switch between the Ordon Sword and the Master Sword, as well as the Wooden Shield and Hylian Shield, and three different tunics. The biggest change in the gameplay of Twilight Princess was the inclusion of Link’s wolf form. This was the first time a Zelda game had featured an animal transformation since A Link to the Past. The wolf form was an integral part of the game. It was brought on by the Twilight, a shroud of darkness that appeared when the Light Spirits of Hyrule were attacked. It is interesting to see two key console games which are so similar on the surface yet so different when you really look at them. The Wind Waker and Twilight Princess are considered two of the best games in the Zelda series, favored among many fans of the franchise. Despite their differences in style, these are certainly fantastic games. Depending on what you like, you may prefer the bright, vibrant motif of The Wind Waker, or the gritty, serious aura of Twilight Princess. Or you might just like both!